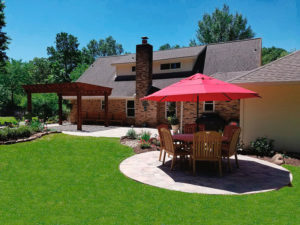 The Landscape Design Professional Builders Kingwood Depends On To Get The Job Done Right! Warren’s Outdoor Living is a Kingwood Landscaping company that features a team of talented experts to design and build your dream landscape. Tour your ideal outdoor space through 3-D designs. Our landscaping division is comprised of skilled professionals carrying degrees and licenses. 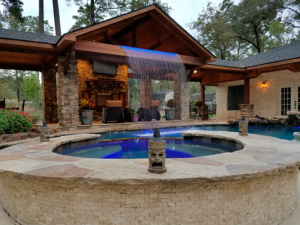 We work collaboratively with our clients to create imaginative spaces that integrate all of your outdoor living needs from plants to pathways, landscape lighting, sprinkler systems, and much more. We create beautiful outdoor kitchens for special gatherings with family and friends or for those important business events. Warren’s enhances our projects with stylish high end Belgard pavers, quality granite, faux stones, and Vintage brand luxury grills & stainless steel outdoor kitchen appliances – ensuring many years of reliable use. Family and guests can enjoy their meals while relaxing under the comfort of pergolas, patio covers, ceiling fans, and the warmth of outdoor fire pits or fireplaces. 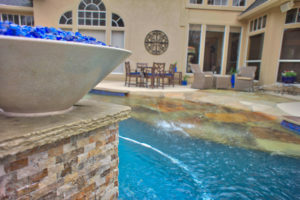 Dazzling water features such as custom ponds, fountains, and pools can create a soothing outdoor living experience. We beautify pools with waterfalls, grottoes, water arches, rain walls, and water curtains. Your inground pool can also perform energy efficiently by incorporating heat pumps, automatic cleaners, chlorine generators, variable speed pumps, LED lighting, and automated control systems. Enjoy the tranquility of your custom designed pool by relaxing on chairs and tables resting within the water. We’re positive you will find all your landscape services here. 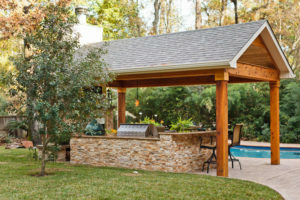 Warren’s Outdoor Living is focused on providing high-quality service and customer satisfaction – we will do everything we can to meet your expectations. Serving Kingwood and all neighboring areas Oakhurst, Humble, Atascocita, Summerwood, Eagle Springs, Lakeshore, River Walk, Valley Ranch, Porter, New Caney, Tavola, Northcrest Ranch, Huffman, and Fall Creek.